Press Release from the Climate Science Rapid Response Team | Global Warming: Man or Myth? The Climate Science Rapid Response Team has upgraded its Web presence in order to provide more information about its service to you. Please visit http://www.climaterapidresponse.org to see the new and improved site. The new site makes it very easy for you to place your enquiries and it also features Enquiry Highlights, Testimonials, and a valuable set of Resources for you to use. The team of scientists now numbers greater than 100 from all of the diverse areas related to climate science and includes members from NASA, NOAA, NCAR, Hadley Center, UREL, LLNL, and many major research universities. We are inviting more scientists every day and most have accepted our invitation because they understand scientists have a responsibility to engage the public by engaging the media. These are the top scientists in the field who have very busy schedules. They have agreed to make themselves available to you in a rapid fashion to provide you the information that is needed to get the story right. For every one of these 100, there are probably 10 to 20 equally qualified people whom we have not yet contacted. There is a huge body of scientific work going on all over the world to understand our climate system and humanity’s influence on it, and we will continue to enlarge this team as our resources permit. We encourage you to continue to use our service and to communicate our service to others in your field. For further information please feel free to contact us. I would like to send this site to the local news outlets. Do you have Canadian scientists too? They often like to interview researchers close to home. Mandia: Please do and yes, I believe we do have a Canadian or two on board. I’m an enviro jurno with a global beat and have used this a couple of times. Even over the holidays I received fast, understandable responses to my climate science questions. I highly recommend it. Mandia: Thank you for your kind words. 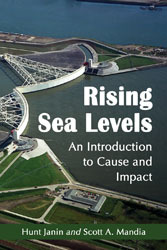 I’m writing an introductory survey on sea level rise and am beginning it with a short (17 pp. double spaced), simple chapter explaining global warming. As a generalist, I want to be belt-and-braces sure that I have my facts right. If anyone might want to read this chapter very critically, please contact me off-list at huntjanin@aol.com. Thanks.